The concerts of the jazz festival “Brodsky Drive” will be held every weekend, from June 18 to July 17, in the garden of the Fountain House (Museum of Anna Akhmatova) at Liteiny Prospekt, 53. 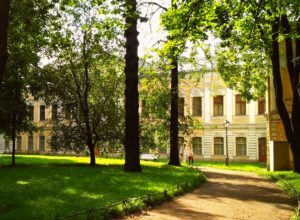 The Anna Akhmatova Museum invites you to cozy musical evenings, organized in the best traditions of the northern capital. Here the classic meets avant-garde, masterly performance – with a democratic atmosphere, and listeners – with musical experiments and improvisation. The festival program includes 8 concerts of modern jazz from Russian and foreign musicians. Jazz, born at the junction of cultures, based on improvisation, intuition, impulsive rhythms, was the favorite music of Joseph Brodsky. Many of his works are similar to jazz compositions. They are rhythmically, atmospheric and stylistically connected with the aesthetics of jazz. The music festival “Brodsky Drive” was held for the first time in 2015 and was timed to coincide with the anniversary of the poet. Today the festival has become a summer open-air, to which the world stars come every year. In case of rainy weather, organizers offer raincoats and blankets for guests. All concerts begin at 19:00. The cost of admission is from 300 to 500 rubles. Tickets are sold in the ticket office of the museum.